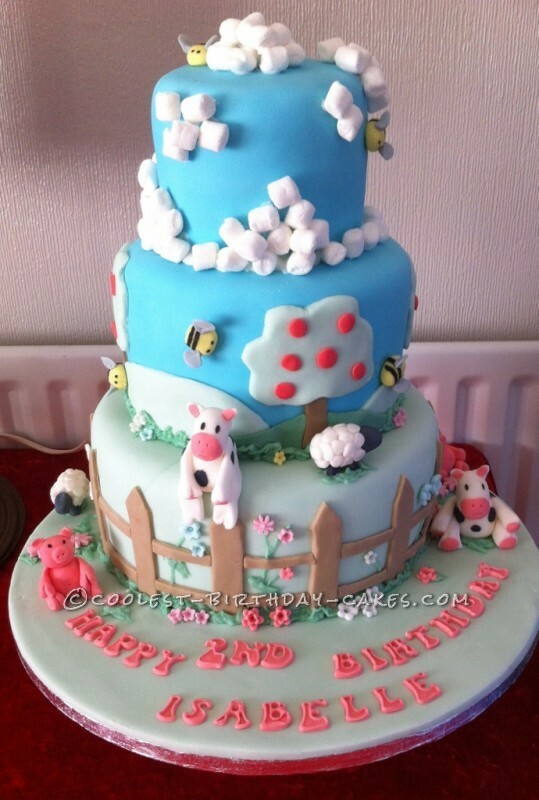 A friend of ours asked me to make another cake for her daughter’s 2nd birthday, the theme was a farm as her party was at a farm. She sent me details of how she wanted it made. I had to make cows, pigs, bee’s and sheep. It was a three tier cake. I made the cakes. 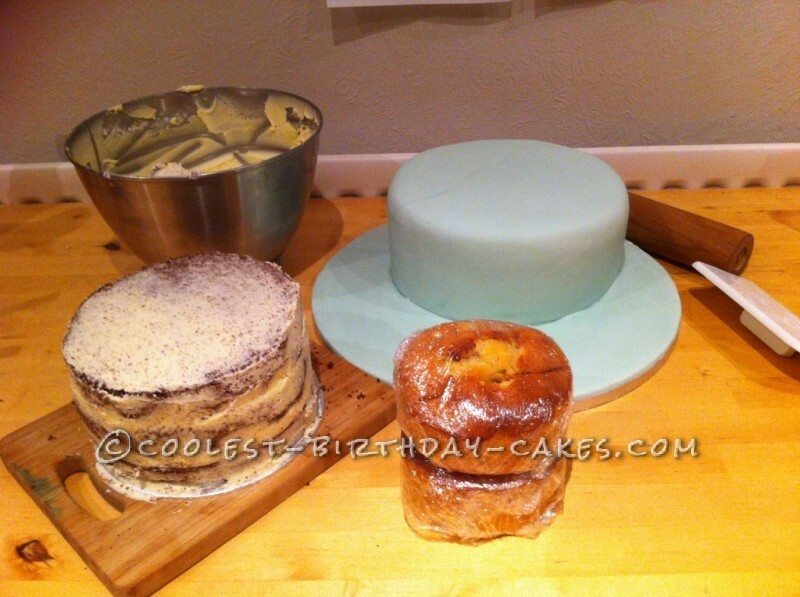 The top one was a 4.5″ which I made two deep cakes in vanilla sponge, the middle tier was a chocolate sponge 7″ and the bottom tier was a 9″ vanilla sponge cake. I filled all the cake with jam and butter cream and starting with the bottom tier I covered the whole cake in butter cream and chilled this in the freezer for 10min and then spread a second layer of butter cream and chilled for 10min. so it would be smooth when iced. I then covered in light green icing which I had colored previously. I then placed 4 dowel in the cake to support the 2nd tier. I now covered the 2nd tier in butter cream and chilled and then repeated the process and then covered in blue icing and then attached it to the top of the larger cake just off center so I could attach the animals later. I now butter creamed the top tier in the same way as the last two and iced this in blue icing and attached this to the top of the cake in the center. I then covered the cake board in green icing. This was set aside overnight to harden. 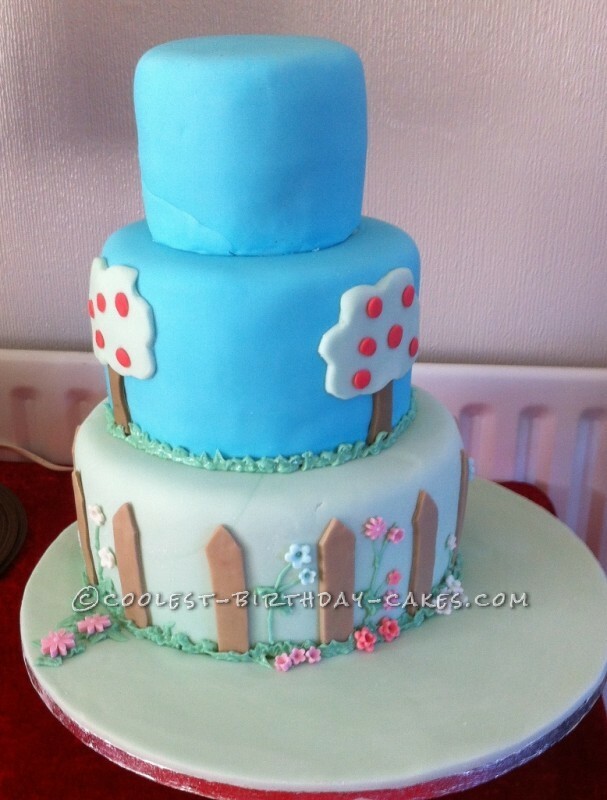 The next day I started by making the fence in brown icing and then pipe iced in green all around the base of the cake to replica grass and piped stems up the cake to attach little flowers later. The second tier I had to make trees so I cut out the trunks in brown and then the leaves and attached small red circles onto each tree. In between the trees I made the fields in different coloured greens. 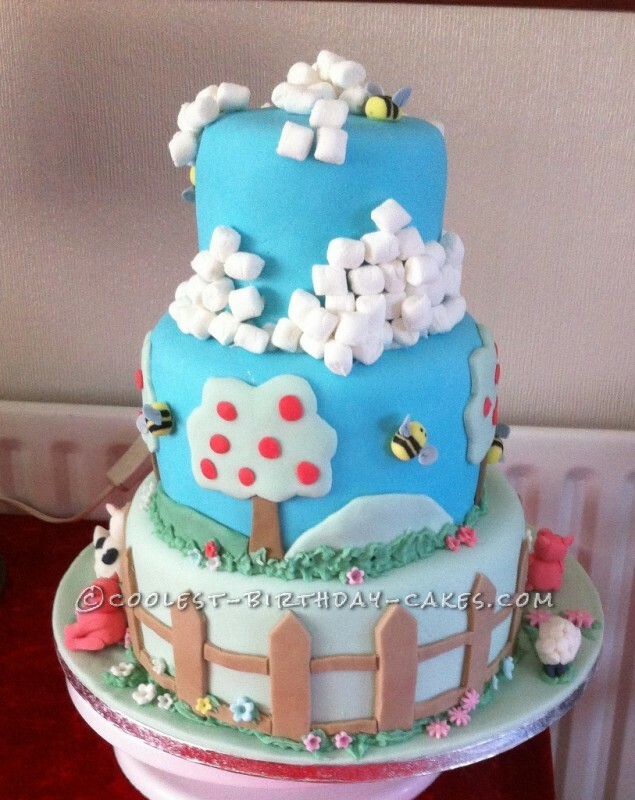 I then pipe iced all around the base of the second cake for the grass again. The top tier I attached some small marshmallows for the clouds. 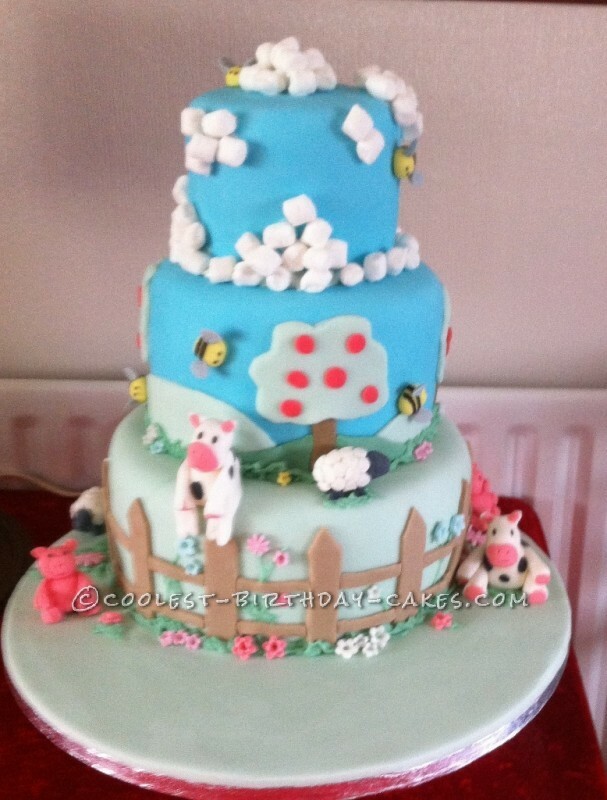 I then attached the bee’s and the animals to the cake and cake board and using a little icing I attached some small flowers I had made earlier. Finally all that I needed to do was the wording, the cake was now finished and she loved it.